Mirage Eclipse Edition has the same iconic look by Patrick Kun with new upgraded materials from inside out. From the tuck case, V3 features a thick black dyed tuck case with an accent of silver foil stamp along sealed with a red metallic stamp. Brand new paper stock? Yes! This edition of Mirage was printed on a brand new “Cardistry” paper from Taiwan. The cards feel extremely soft right out from the box and hold its shape well even after heavy use. Marked deck note: A secret feature was added to this edition of the Mirage playing cards. That’s right. They’re marked! Let’s keep that between us. There is a secret link inside the box which reveals all (in English). It was very important for this marking system to be as practical as possible... and that's how it is! 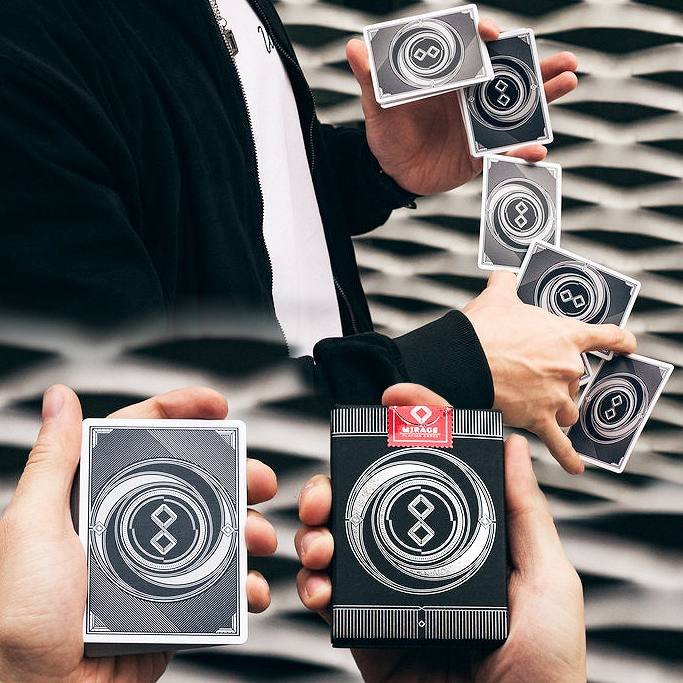 Special features: - Optical illusion back specially designed for both magic and cardistry - Secret marking system that can be read on all four corners. The marking is easy to spot and yet still pass the riffle test! No need to worry about anyone finding out the secrets. - Fully custom court cards by Tomas Hlavaty. - Comes in Juan Tamariz’s Mnemonica stack. Printed by the Legends Playing Card Company (LPCC), the Mirage deck features LPCC's new Cardistry Finish card stock, a super soft and 'papery' feeling stock which requires no break-in period. These cards are traditionally cut with Legends' Diamond Cut process, yielding ultra smooth edges that faro effortlessly from the bottom to top. With a silky coating and quality reminiscent of Bicycle #808 decks from the early 90's, MIRAGE is perfect for any card enthusiasts sleight of hand, Cardistry, or gambling needs. As is always the case with LPCC, the borders on these playing cards are registered to extremely tight tolerances, as their standards allow for zero imperfections. • The cards are poker size. Αυτό το προϊόν προστέθηκε στον κατάλογό μας την Friday 26 January, 2018.